1) It allows for a test of overall curvature. 2) It provides replicated runs, which means that JMP can calculate an unbiased estimate of the error variance. The Fit Model platform will also do an automatic lack-of-fit test. You can add center runs in JMP 9 after design creation. How does pre-specifying help? Adding center runs as part of specifying the experiment design allows the custom designer to add these runs optimally. This does not matter if all the factors are continuous. However, if a factor is categorical, then optimal assignment of the center runs in the continuous factors can improve the design. Isn’t it best to just add one center run for each level of the categorical factor? Surprisingly, this turns out not always to be true! 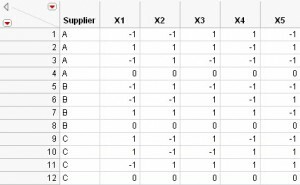 Imagine a setting where you have three suppliers and five continuous factors you want to investigate with a main effects model using 12 runs. You decide that you want three of the runs to be center runs. It turns out to be more statistically efficient not to have one center run for each supplier. 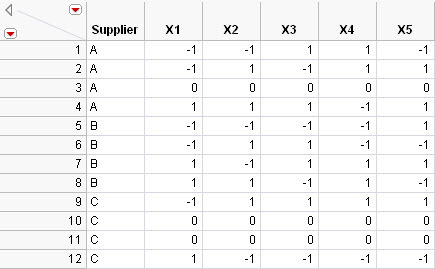 Table 1 displays the factor settings for the optimal allocation of center runs to suppliers. 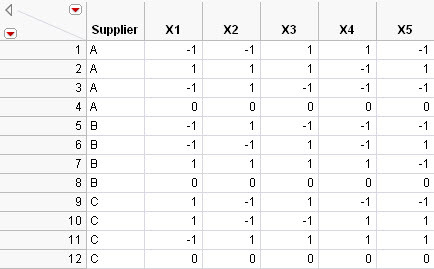 Note that there are four runs for each of the three suppliers and that Supplier C has two center runs while Supplier B has none. 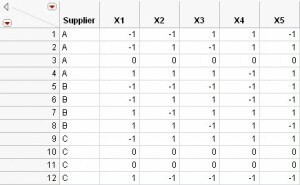 We can compare this design with the optimal nine-run design for the three suppliers with one center run added for each supplier. You can see this design in Table 2. I feel more comfortable with the even allocation. What am I losing? First, the maximum variance of prediction for the design is more than 50% bigger for the design with even allocation. Also, the average variance of prediction is more than 10% bigger. Figure 1 shows that estimated coefficients also have larger variances for the design that allocates the center runs evenly. For every parameter, the variance inflation factor (VIF) is larger for the design with even allocation of center runs. Figure 2 shows side-by-side plots comparing the column correlations for the two designs. The design for even allocation of center runs has messier and generally higher column correlations. This example is interesting, but is this kind of result common? 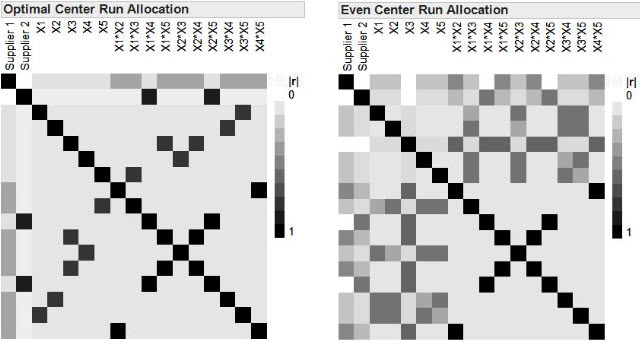 I think that even allocation of center runs to blocks and levels of categorical factors will often turn out to be optimal. 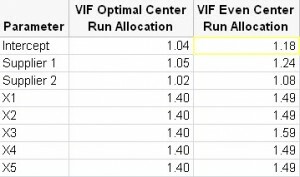 If you take the same scenario with 21 runs instead of 12, the optimal design allocates one center run per supplier. Frankly, I am not a big fan of adding center runs to designs – especially screening designs. I would rather be able to identify the source of any curvature in the response as definitive screening designs do. For replication, I prefer to replicate points that help estimate the effects of interest. Center runs do not help estimate any parameter other than the Intercept.